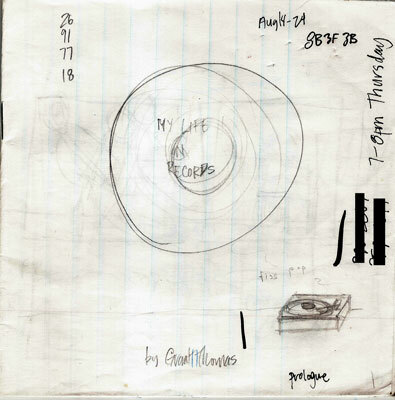 I’ve decided to post some of my thumbnail and rough drawings that I made while making My Life in Records #1. Since I’ve already established the non-canonical stories as “B-Sides”, I thought I’d play up the music lingo puns some more and call these drawings “Demos” and “Outtakes“. “Demos”, of course, are rougher versions of the final pages and “Outtakes” are sequences that didn’t make it into the final book. The picture above was meant to be the title page. I was in the habit of making little booklets out of scratch paper to make my thumbnails and roughs. This was a habit that went by the wayside when i realized that I sometimes wanted to shuffle sections around or redo a page completely. Of course this story had been drawn once already, so I had an idea of how many pages it would take and the sequence I had in mind. You can see I scribbles notes about color hex codes, appointments and phone numbers (redacted, of course). I originally wanted the reader to have that sense of expectancy I used to get when I first put the needle down on the record and you heard the initial vinyl crackle before the first track started. For the final version I have opted for a more economic way of starting the book and this section is now, as they say, “on the cutting floor”. You can see the “Album Version” of this page here and the book can be purchased here in the store.